Equally at home on the concert and opera stages, Carolyn Sampson has enjoyed notable successes in the UK as well as throughout Europe and the US. On the opera stage her roles for English National Opera have included the title role in Semele and Pamina in The Magic Flute. For Glyndebourne Festival Opera she sang various roles in Purcell’s The Fairy Queen, now released on DVD. In 2012 she sang Anne Truelove The Rake’s Progress in Sir David McVicar’s new production for Scottish Opera. Internationally she has appeared at Opéra de Paris, Opéra de Lille, Opéra de Montpellier and Opéra National du Rhin. She also sang the title role in Lully’s Psyché for the Boston Early Music Festival, which was released on CD and was subsequently nominated for a Grammy in 2008. Carolyn Sampson’s numerous concert engagements in the UK have included regular appearances at the BBC Proms and with orchestras including The Orchestra of the Age of Enlightenment, The English Concert, Bach Collegium Japan, Britten Sinfonia and The Sixteen. 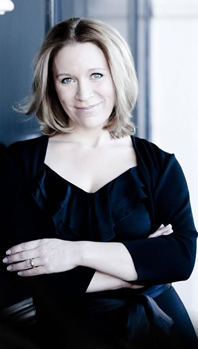 She is a frequent guest with the Hallé and has performed with City of London Sinfonia, Scottish Chamber Orchestra, Royal Liverpool Philharmonic and City of Birmingham Symphony Orchestras. In Europe her many appearances have included concerts with Bergen Philharmonic, Royal Concertgebouw Orchestra, Freiburg Baroque Orchestra, Symphony Orchestra of the Bayerische Rundfunk, WDR Symphony Orchestra, Orchestra dell’Accademia Nazionale di Santa Cecilia, Gürzenich Orchestra, Rotterdam Philharmonic, Leipzig Gewandhaus Orchestra, Vienna Symphony Orchestra and the Salzburg Mozarteum Orchestra.